We have been investigating alternative methods of consolidating glass fractures. 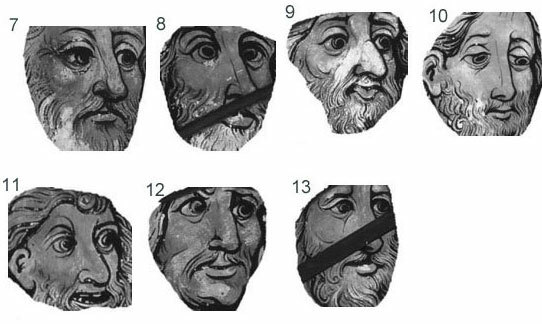 The techniques we have tested are inspired by methods used in other conservation disciplines. 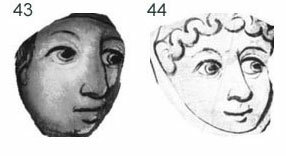 Japanese paper applied with wheat starch is a standard treatment used by paper and paintings conservators and it has also been used to repair very fragile and corroded archaeological glasses as well as other objects. 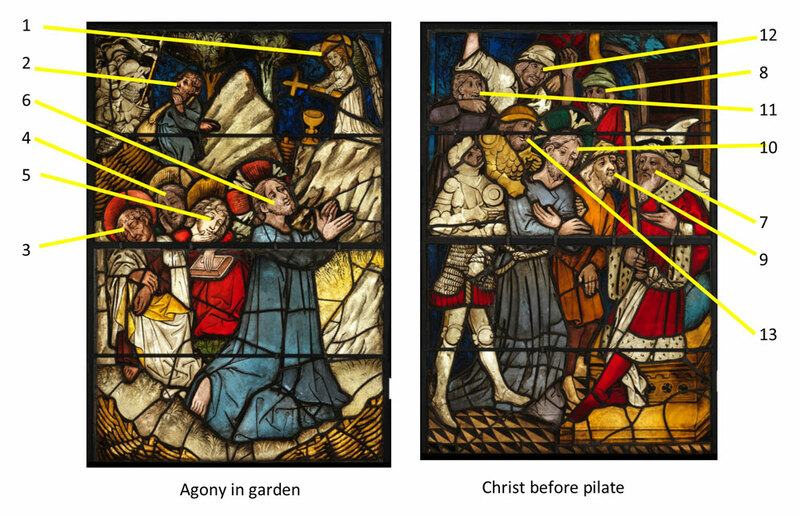 We tried this technique to temporarily secure fractured glass in situ in an early 16th century stained glass panel from Fawsley Hall. This was initially intended to be a temporary repair, but two years on the repair is unchanged and still very effective in supporting the broken glass. We are monitoring the panel to assess the durability of the repair over time, although we do plan to replace the paper at some later stage. 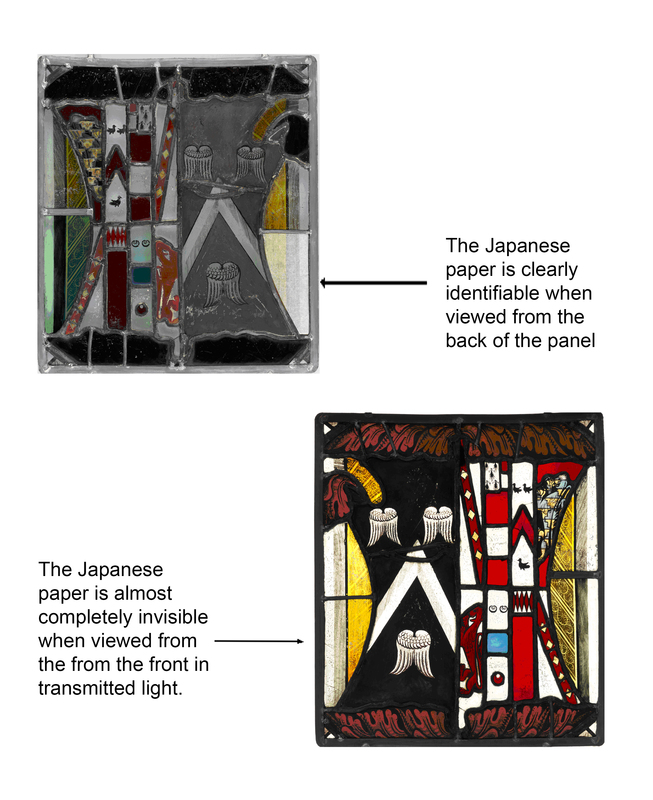 The Japanese paper is barely noticeable in transmitted light, but in reflected light it is clearly visible. 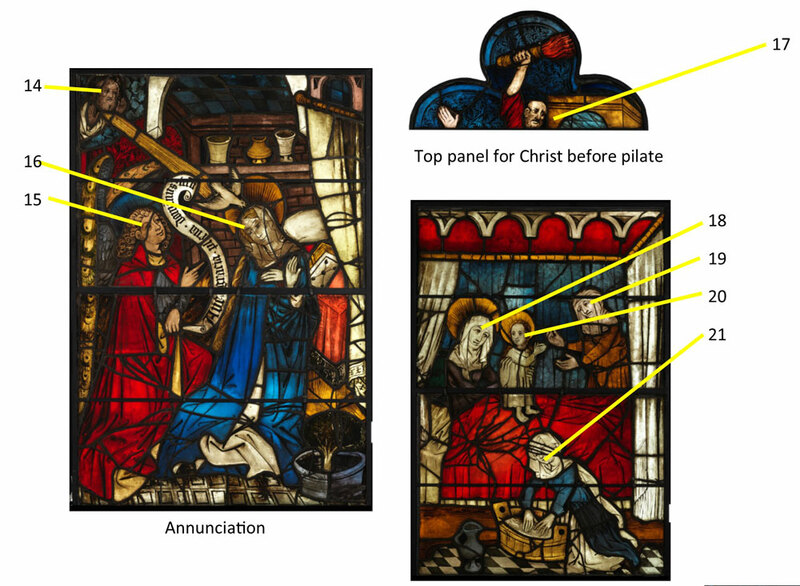 This makes it acceptable as it does not interfere with the imagery of the panel from the front, but it can be easily identified as a repair when viewed from the back. 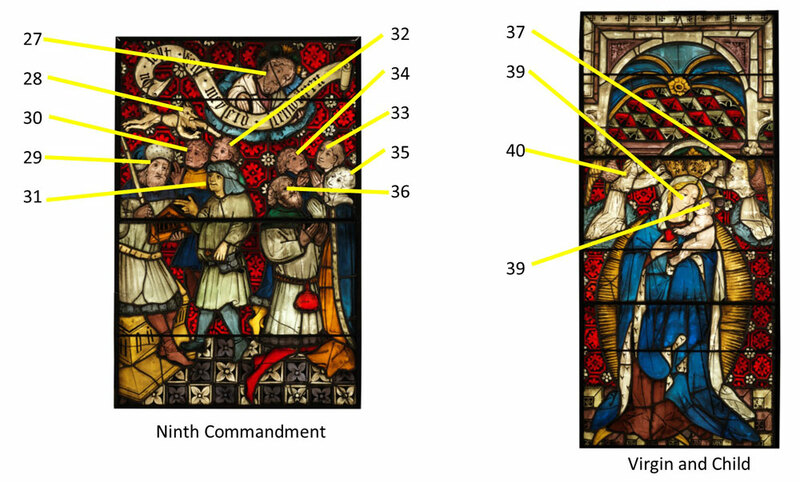 Wheat starch as an adhesive is easily reversed using moisture, which is great if the stained glass is in a protected and accessible display, but obviously not suitable for stained glass displayed in a damp building. The other draw back of wheat starch is that the paste is organic and a potential food source for micro organisms, so again it will be less useful in a damp environment and in locations where the glass will not be looked at for years. Based on our success with paper we decided to test materials that are stronger and more durable than paper but similarly transparent and without too much distracting texture. 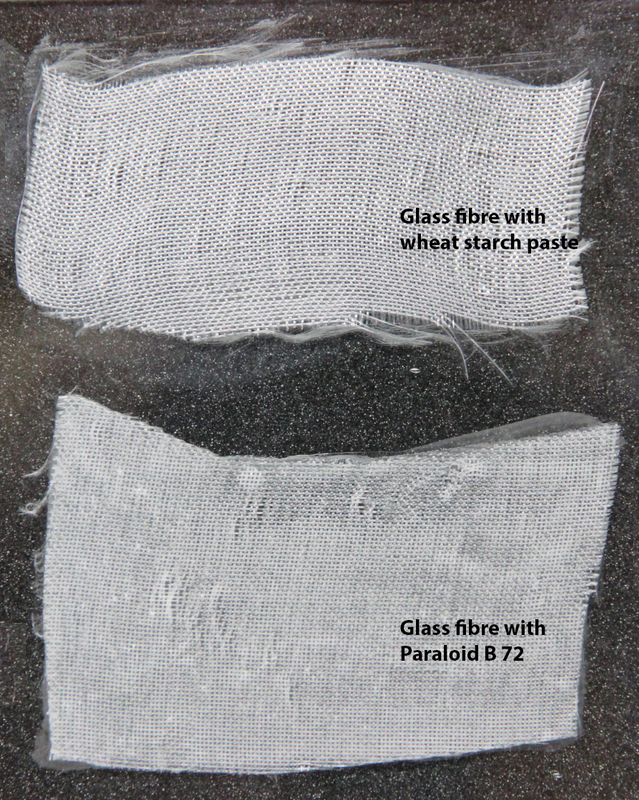 We considered a variety of fabrics with advice from textile conservator colleagues, and decided to compare light weight nylon, silk, polyester and glass fibre fabric alongside Japanese tissue. 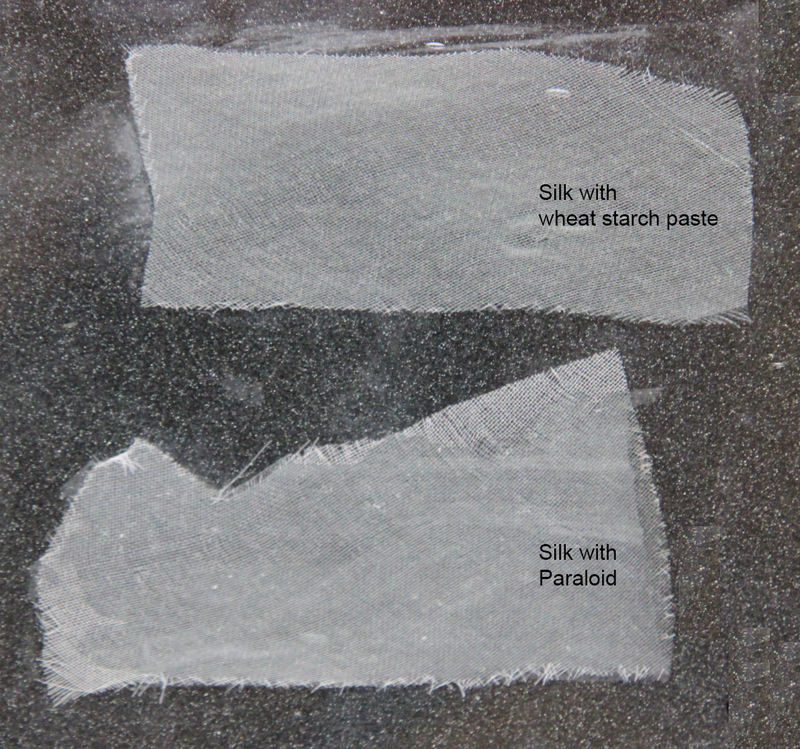 We applied the samples with Klucel G (wheat starch paste) and Paraloid B72 (a thermoplastic resin) to investigate the pros and cons of each adhesive. 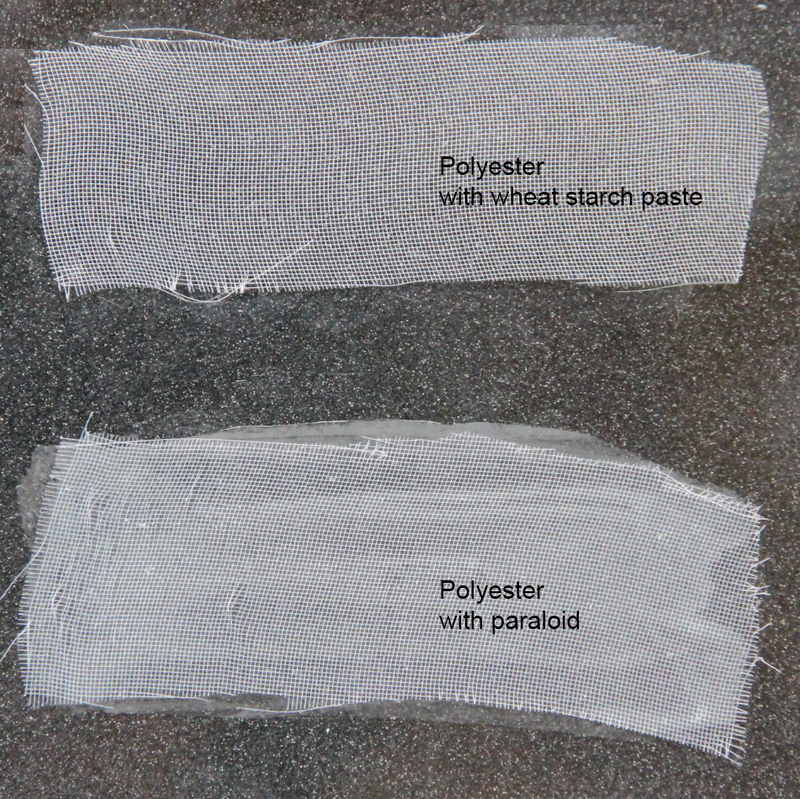 Our first test results are unambiguous: in terms of ease of application and quality of the results the samples applied with wheat starch paste look much better than those applied with Paraloid B72. We plan to carry out more tests with Paraloids in a variety of solutions to see if we can achieve a satisfactory result. 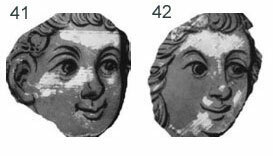 Using a resin would make the method more suitable to use in a wider variety of display conditions. 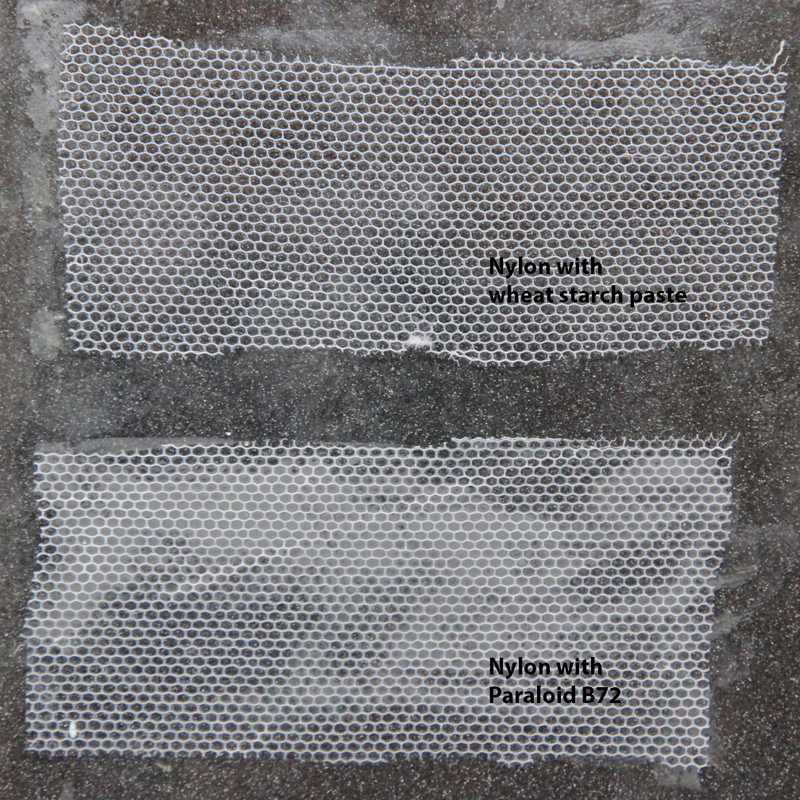 As for the fabrics: we found that the honeycomb pattern of the light weight nylon net was visually distracting against a piece of transparent glass. Silk crepeline has a fine, hardly noticeable texture and is semi transparent, but is awkward to apply and tends to distort. It is a natural fibre and while it is initially quite strong, it is not very durable and deteriorates in daylight. The woven glass fibre fabric also has a tendency to distort during the application process, and it frays easily at the edges. We were initially quite positive about using this material – it seems logical to use a glass based fabric on glass – but we actually found that it was more visually intrusive than many of the other fabrics. Based on our sample tests we found that a polyester fabric is structurally stable and provides good support, it has good durability and it does not have a distracting texture. 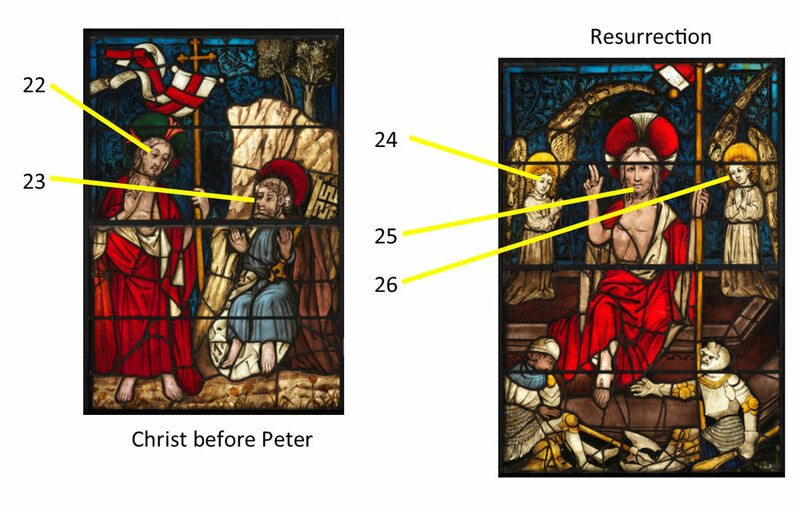 We therefore decided to test it on some fractured stained glass. In the next blog we will discuss the results. 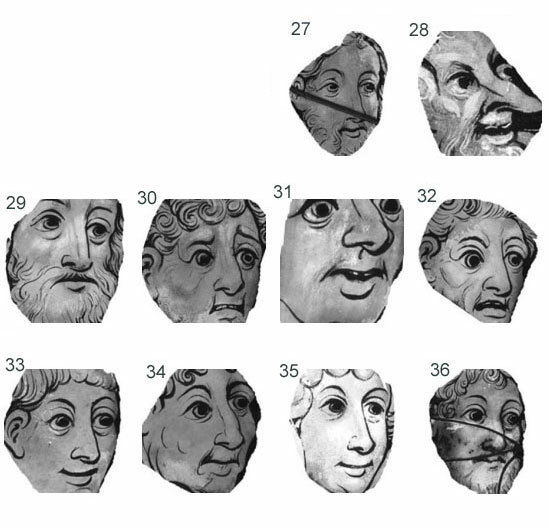 In this blog, we are identifying the faces and showing the percentage of the forms completed that selected faces as good or bad, and more specifically, God, Jesus, Mary and the Devil. 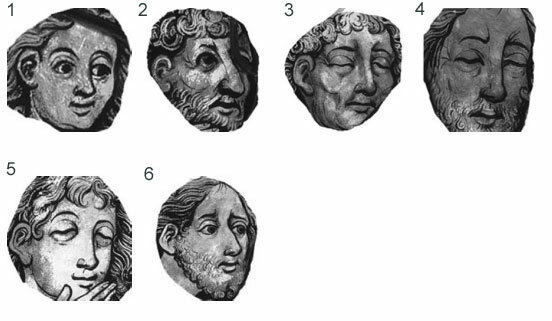 Our next faces blog will be a more general discussion of the faces in the Boppard panels. Many thanks to all who took part in our survey!